I meditate upon the supreme Ganapati who is worshipped by Vasishta, the Vamadevas, etc. He is the son of Lord Shiva, is praised by Guruguha. He shines bright like millions of cupids. He is tranquil. He loves great poetry, drama, etc. He loves the sweet Modaka. His mount is a mouse. Happy Vinayaka Chaturthi to all ! Today is the most important day for the worshippers of Vinayaka, also known as Ganapathi, Ganesha, Vigneshwara etc. The beloved elephant headed God is worshipped all-over India but is especially beloved to the people of Maharashtra and South India. An ancient God, there are indications that He was worshipped as early as in 1200 BC. “You of the twisted trunk and massive body with the dazzle of millions of suns, Lead me Lord on a path that has no obstacles or hindrances in all my good endeavours”. Ganapathi is worshipped in 32 different forms such as Bala Ganapathi (child God), Veera Ganapathi (Warrior God), Siddhi Ganapathi (God of Achievement) etc. My personal favourite, given my love of music and dance, is Nritya Ganapathi (the Dancing God), whose picture adorns today’s post. Much as the rotund form of Ganesha is beloved to us, today we should look beyond the obvious into the symbolism of this form. His large and rounded body denotes the entire universe. He is the embodiment of all. The Elephant, which is a vegetarian and doesn’t kill to eat, signifies gentle strength. An elephant also responds to love and affection as God will respond to our love. The large head symbolises wisdom. The large ears sift truths from untruths. The curved trunk denotes the primal sound, the mystic OM. This symbol in Sanskrit ॐ resembles an elephant and his trunk; the Tamil ஓ resembles the head and trunk. The trunk also is a symbol of discrimination – the same trunk has the strength to pull up a tree or pick delicately at the smallest of things. The great stomach symbolises that Ganesha swallows the sorrows of the universe and protects the world. The mouse which is underfoot symbolises the petty desires and ego of man which needs to be vanquished. 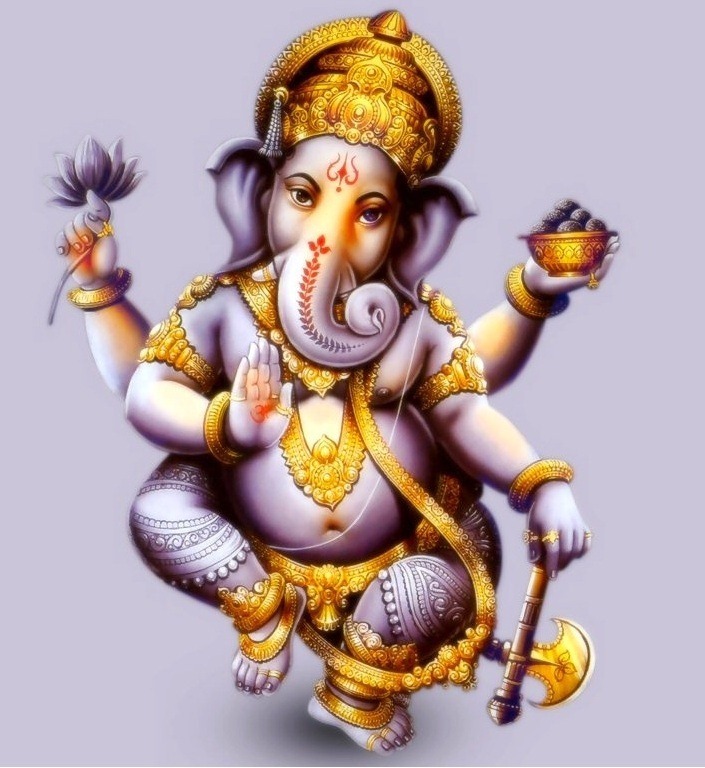 Ganesha is shown to hold different items in his hands, about 40 different ones being common. Each represents an attribute. In the picture above, one hand in the Abhaya pose says ‘Don’t fear, I am here’. A hand holds the double headed axe to symbolise his destruction of impediments and evil. A hand holds the lotus flower, which indicates purity as the flower grows unsullied even in the dirtiest of ponds. The fourth hand holds Modaks, the sweet dear to Him. Today thousands of worshippers will offer these sweets to their dear deity. Modakam in Sanskrit means that which gives joy and pleasure (Moda); just as this sweet gives us joy, Ganesh too blesses us with joy. In honour of Ganapathi, I present the short invocation Maha Ganapathim Manasa Smarami (I meditate on the great Ganapathi) written by Muthuswami Dikshithar (1775-1835) and set to raga Natta (to know more about this raga, click here). This familiar and well-loved song is very often sung at the start of Carnatic Music concerts, as all good tasks should be started by invoking His name. To present this song, let us start with the gentle voice of Yesudas singing in the film Sindhu Bhairavi. For an instrumental version, listen to U.Srinivas on the Mandolin here . A notation is available in this site. I meditate (smarAmi) on the supreme (mahA) Ganapati who is worshipped (vandita) by Vasishta, the Vamadevas, etc (Adi). He, the son (sutam) of Lord Shiva (mahAdEvA), is praised (nutam) by Guruguha. He shines bright (prakAsham) like millions (kOti) of cupids (mAra). He is tranquil (shAntam). He loves (priyam) great poetry (mahA kAvya), drama (nAtaka), etc (Adi). He loves (priyam) the sweet Modaka. His mount (vAhanam) is a mouse (mUshika). Happy Ganesh Chaturthi to you Suja ! And thanks for all those very interesting explanations.